Namibia is best known for its stark, dramatic and timeless landscapes. It boasts the world's oldest desert (Namib), the second largest canyon in the world ( Fish River ) and some of the world's tallest dunes (Sossusvlei), alongside the continents largest salt lake (Etosha). Namibia offers a unique feeling of tranquility and stillness in a landscape singular in its colours, full of contrasts of light and shade. You will encounter vast unspoilt areas of great scenic beauty, unconfined space, clear unpolluted skies and the sun which is nearly always shining! With unusual landscapes including Sossusvlei, Fish River Canyon and Spitzkoppe, the colourful Himba people, desert-adapted rhino and elephant, the largest population of cheetah in Africa, hot-air ballooning, mobile tented safaris and one of Africa's most famous National Parks - Etosha, Namibia makes for a wonderful safari destination. Namibia is dominated by the continent's oldest natural phenomenon, the Namib Desert. Largely uninhabited and mostly unexplored, this is a near lunar landscape of immense diversity, with gravel plains and salt flats, dune fields and glinting quartz formations - a desert in the truest sense of the word. Noteworthy, are the Namib Naukluft Park itself as well as the Sossusvlei area and Sandwich Harbour (where the sand dunes meet the sea). The Namib Naukluft Park is the largest conservation area in Namibia, measuring almost 50,000 sq. km and incorporating most of the 130 million year old Namib Desert after which Namibia takes its name. This is a land of ethereal landscapes and endless horizons, sun-bronzed and untamed, it is a place of silence and of solitude. A climb to the top of one of the gigantic sand dunes surrounding Sossusvlei to watch the sunset slowly cast its shadows over the ancient sea of surrounding dunes is so haunting, it will be etched in your mind forever. 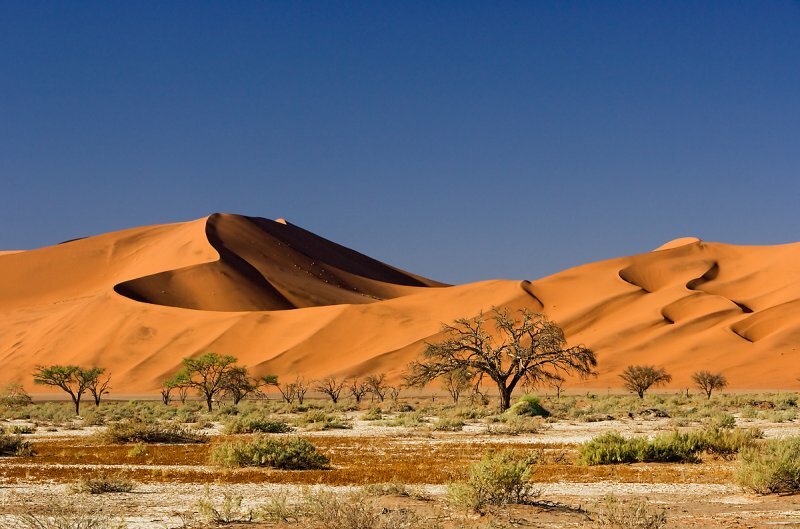 Sossusvlei is a dune wonderland featuring wind-swept dunes up to 300 metres high surrounding a large, dry pan. The surrounding area offers spectacular colour contrasts at dawn and dusk and features an endless sea of apricot coloured sand dunes stretching into the distance. . Strong winds constantly shape and reshape the landscape, sculpting crescent-shaped valleys into towering dunes (called parabolic or multi-cyclic dunes vs the rippled linear dunes of the central Namib). A walk along the ridge of a 1000ft dune is quite an experience - as are the changing shapes and colours of the dunes as the light changes in the early mornings and evenings. 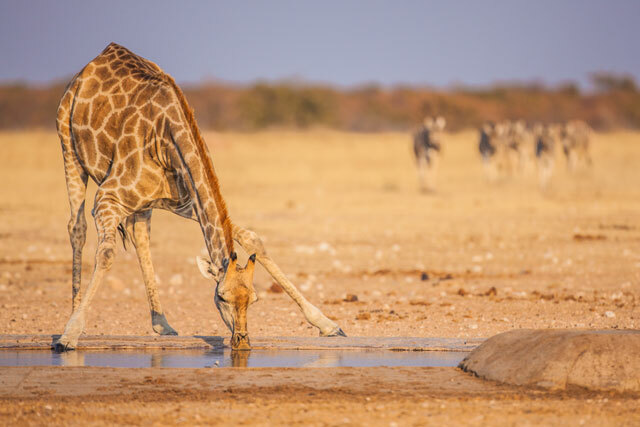 Etosha, meaning 'place of dry water', is centred around a huge, flat calcrete depression (or pan) of about 5,000 square kms in extent in far north Namibia. The 'Pan' provides a great, parched, silver-white backdrop of shimmering mirages to an area of semi-arid savannah grassland and thorn scrub. The pan itself contains water only after very good rains, and sometimes for only a few days each year, but is enough to stimulate the growth of a blue-green algae which lures thousands of flamingos. This is one of Africa's major wildlife sanctuaries, being proclaimed a game reserve in 1907 and covering an area of more than 22,750sq kms. Despite being a highly 'managed' environment featuring a cluster of man-made water-points around the central Etosha pan, with its boundary designated by a patrolled electrified fence, this is indeed one of Africa's top game sanctuaries. During the drier months of June to November the water points exert a magnetic pull on the big game herds, forming the centrepiece for visitors looking to see the nearly 150 mammal species to found in the Park, including several rare and endangered species such as the black rhino, black-faced impala, tssesebe and gemsbok. The mountainous desert region of northern Damaraland features some of Namibia's least explored, rugged and remote areas. Here, in one of the few remaining untouched wilderness areas of Africa, it is easy to see why the San people call Namibia 'the land that God made in anger'. The emphasis is on the spectacular scenery, dominated by massive flat-topped mountains and crystal blue skies; the uniquely adapted smaller desert creatures and plants; the peace and tranquillity of being in such a remote area; and if you are fortunate, catching sight of the desert-dwelling elephant and black rhino that roam the area. Kaokoland, home of the Himba people, cattle herders who continue to live today as they have done for generations. For them the cow is sacred, and life revolves around the health of their herd. Although still living in absolute poverty the Himba have developed a passion for metal and braided leather jewellery. Many of the women wear large collars in red copper (ondengura) and everyone covers their body in a protective red make-up called otijize , extracted from the stone hematite. There are very clear rules governing adornment, since the Himba see their bodies as a living expression of their culture ( a common feature of nomadic peoples). The comparison with another local tribe, the Herero, is striking: Herero women wear long dresses with wide stiff skirts, a fitted bodice, shawl and headdress. Needless to say, this stifling Victorian attire is the legacy of puritanical 19th century missionaries who considered native women to be immodest. The Skeleton Coast, which starts south of the Orange River, includes the whole Namibian coastline and continues across the Kunene River some 200 km into Angola. 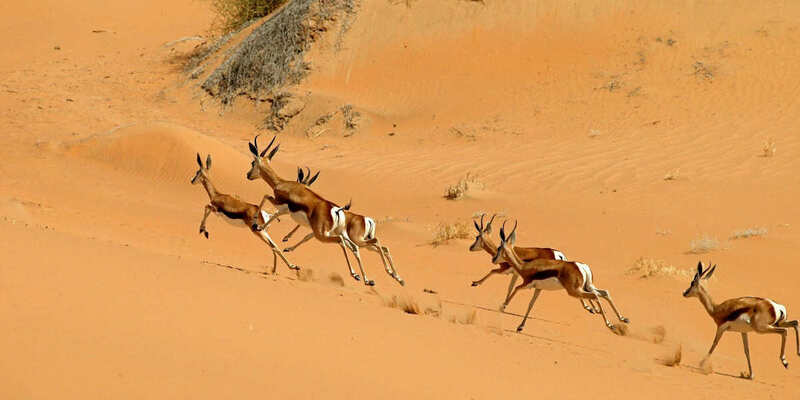 It is part of the Namib Desert, various sections of which have conservation status, namely the Namib-Naukluft Park in the south, the Skeleton Coast Park in the north (between the Ugab and the Kunene rivers) and the Iona Park in Angola. The coastline and adjoining Namib Desert form a sparsely populated area with landscape, animal and plant diversity which varies from region to region. At face value, the 500km Skeleton Coast is one of the bleakest stretches of coastline anywhere in the world, frequently bathed in a dense fog and battered by freak Atlantic tides. The coastline's sinister reputation is well founded, with many a shipwrecked mariner having perished here, stranded in an arid wilderness, hundreds of miles from human habitation. Skeletal remains of beached ships add to a sense of eerie desolation. Yet, in its own haunting way, the Skeleton Coast is beautiful. Its moods are constantly shifting with the lifting of the fog and changing light as day passes into night. And at waterholes a surprising number variety of hardy desert animals can be observed, including springbok, gemsbok and jackal. The Fish River Canyon is Namibia's answer to the Grand Canyon. At 100 miles (166 kms) long and 2,000 feet deep (over 600m) the Fish River Canyon is the second largest canyon in the world. The formation of the canyon dates back to around 650 million years ago and began forming during the movement of tectonic plates as the supercontinent Gondwana split. Over these hundred of millions of years Fish River, and at points glaciers have slowly worn away at the once solid plateau creating a mesmerizing canyon. Visitors can hike the trail in the winter months from May – September; however, during the summer months the risk of flash flooding prevents hikers from tackling the 88km challenge. It is set in a harsh stony plain dotted with drought resistant succulents, in itself a spectacular phenomenon which took hundreds of millions of years to evolve into its current shape. Stunning vistas and endless skies abound. Fly-in or Guided Tour Namibia is blessed with an excellent road infrastructure. So although distances can be long, going by road is often a good option. Charter flights are also available on a seat basis or perhaps you would prefer to join a set departure and mix in with other visitors from around the world. Talk to us about the options available.. But there are parts of Namibia where a fly-in safari is by far the best, and sometimes only, way! Unique to Namibia are the fly-in safaris to the Skeleton Coast and north to the Kunene river. On these safaris, you will visit the most isolated, beautiful, remote (and private) northern sector of the country where time seems to stand still. The added attraction of a fly-in safari is that you get to see these areas from the air, giving you the opportunity to trully appreciate some of the most dramatic landscapes on the continent. Highly recommended. Many people maintain that until you have experienced a mobile tented safari you really haven't been on safari! A mobile tented safari is a great way to see Namibia - and often one of the more inexpensive options. Ask for details..
More and more lodges and safari camps in Namibia are welcoming families, including children as young as 4 and 5 years. Many now offer 'family rooms' with adjoining bedrooms and shared bathroom. A number have speciallly designed children's programs and guides selected for the role. 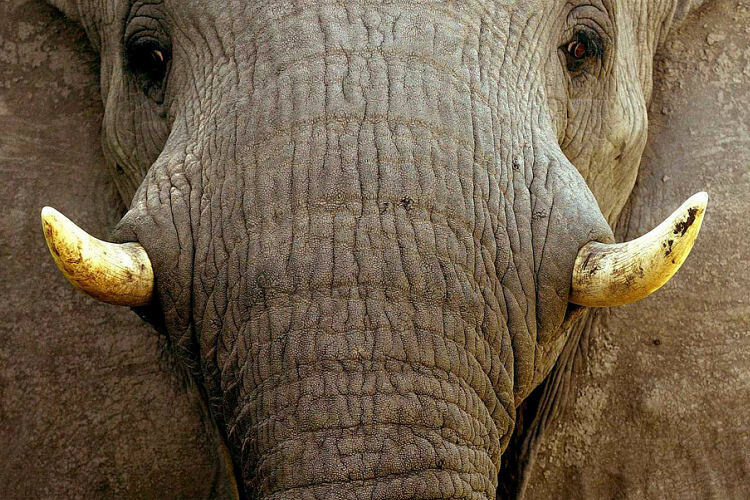 Families with children under 8 yrs may be asked to reserve a private vehicle for game drives. Whilst structured horse riding safaris are not available in Namibia it is possible to include horse riding at a number of the safari camps. Ask for details.. There are a few wonderful walking trails available in Namibia (and highly recommended) - ask for more details..
Hot-air ballooning over the Namib must surely be one of the most spectacular places to take a balloon flight. Alternatively, arrange a scenic flight that takes you over the dunes and as far as the coast - absolutely spectacular! Quad bikes (and mountain bicycles) are now becoming popular at a number of lodges in the Namib. Ask us where to go.. There is a luxury overnight train that travels between Windhoek (the capital) and Swakopmund on the west coast. A nice relaxing way to travel and see the countryside. Ask us for details. Namibia is a wonderful destination for families with more and more lodges encouraging families with family units/rooms and special children's programs. Read more.. Canoeing For the more adventurous there is canoeing on the Kunene River in the far north downstream from the Epupa Falls. Ask for more details. With an extensive coastline Namibia is well known for its wonderful fishing opportunities too - keep it in mind. Swakopmund is the premier holiday town of Namibia and popular amongst visitors because of its old world charm and relaxed atmosphere. Founded in 1892 during the period of German colonial rule it served as the territories main harbour town for many years. A seaside resort town on the west coast of singular charm, and resembling a Bavarian village with magnificently ornate buildings dating back to the turn of the (20th) century - including the local jail, railway station and lighthouse. It has a restful and relaxing atmosphere with promenades, palm trees and beautifully tended public gardens. Today this curious desert town, hedged by desert and sea, is enhanced by lush green lawns, palm trees and carefully tended public gardens. The sweep of coastline with its desert hinterland offers many options, both for adventure and for relaxation. Quaint architecture from a bygone era adds to the time-out-of-place atmosphere of the town. When approached from the interior, domes and towers on the skyline appear as a hazy desert mirage. Much of the distinct German colonial character has been preserved and today many of the town's old buildings house shops, offices and other utility services. Graced with many beautiful old buildings in a variety of architectural styles the best way to experience this small town is on foot. Various historical buildings, museums, coffee shops, shopping arcades with specialist shops, the National Marine Research Centre and Swakopmund aquarium can be visited. Most visitors stay in Swakopmund, where they eat and relax, and venture down to Walvis Bay to go birdwatching, as there are a number of sites attracting huge flocks of sea birds and migrant waders, including the famous flamingos and pelicans. 42kms south of Walvis Bay - a large, reed lined marine lagoon is home to many rare coastal and freshwater birds. Accessible only to day visitors by 4x4 vehicles. Sandwich Harbour is a unique wetland that marks the beginning of the desert and the end of the ocean - or the other way around! It is a superbly scenic location with the rather unusual feature that whilst salt water flows into the tidal reed-lined lagoon from the sea, freshwater seeps in from aquifers under the dunes. It should be borne in mind that Etosha is a public park and as such is frequented by self-drive visitors from throughout southern Africa. Like Kruger, the Park does not allow visitors to exit from their vehicles at any time. Most visitors spend their time driving between, or sitting at, the many waterholes to be found throughout the park. You will seldom be on your own. Walking is not an option and even your game-viewing vehicle is 'closed' (vs the more open vehicles used elsewhere in southern Africa). The rest camps are relatively large and include campers. Know what to expect in this regard. Mobile safaris is are generally 7, 10 or 14 days and tend to start and end in Windhoek. Namibia combines well with South Africa and Botswana and/or the famous Victoria Falls. The Namib can be extremely hot from October through to March! During the winter months, April through August, the evenings can get very cold (especially the wind-chill factor when out in the early morning and late evening in an open game vehicle (most lodges will provide fleece-lined ponchos and blankets!). SUMMER : November - April, days are generally hot and sunny. Daytime temperatures can rise to 350C and night temperatures drop to around 140C - 180C. The coastal region is cool and dry throughout the year. The rainy season runs from February to March and average rainfall varies from less than 50mm along the coast to 350mm in the central and 700mm in the far north-eastern regions. WINTER : May - October, days are dry, sunny and mild to warm while evening temperatures drop sharply. Daytime temperatures generally reach 230C and can drop to as low as 00C - 100C at night. It can be quite cold and windy at the coast, for which warm clothing and a wind-breaker are necessary. - Good roads and infrastructure/services. - Vast unspoilt areas of great scenic beauty, unconfined space, clear unpolluted skies. - The feeling of tranquillity and stillness.a landscape singular in its colours, full of contrasts of light and shade. - Unusual landscapes - Sossusvlei, Fish River Canyon and Spitzkoppe. - The sun, which is nearly always shining! - Home to the largest population of cheetah in existence and the only country in Africa where the cheetah is not considered endangered. - Home also to the unique Quiver Tree and Welwitschia mirabilis plants.